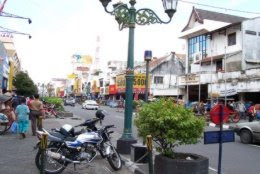 Malioboro can be told as bustle heart of town Jogja, because the many merchants and visitor elapsing grass. A real area multitude either in roadside having corridor or at roadway although one way. From traditional vehicle like pedicab, buggy, bicycle, wagon and also vehicle is having machine like car, cab, town bus, publik transport or motorbike. 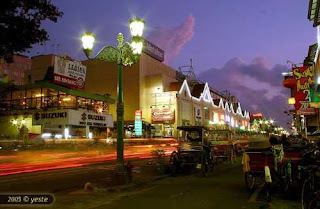 Area Malioboro as one of area wisata town pledge shopping Jogja, this supported by existence of shop, ruma eats, central the its(the cloister merchants. For shop, the shopping centre and restaurant actually same as center business and shopping in other big towns, glorious with big nama-merk and there are also local names. Goods commercialized from import goods and also local, from basic necessities until electronic goods, furniture and others. Also provides multifarious of [crafting/ diligence], for example batik, puppets, matting, bag and others. There is also place of foreign money conversion, bank, hotel is having star finite of jasmine type. Actually Jl. Malioboro from tip of to tip of only distance around 2 kilometre only, but life pulse of area Malioboro have never desisted. The hoisterous of life of shop and cloister merchant performing its(the merchanidise, will be replaced by merchant lesehan when hour(clock starts refers number 9 night. Food provided and on the market from food type typical of Jogja that is rice gudeg and chicken fries as well as food Padang, Chinesse Food and others. When enjoying dish presented, you will be amused by music from quite a lot road street musician from which just bringing guitar adapula bringing equipments of complete music.